Lurline's Place: Tra-Lah! Fairy Quilt Finished! It has taken some time but here we are - all shampooed and spun dry - nice and warm and fluffy just waiting for the cooler weather. Heidi will be pleased! The main fabrics are by Saffron Craig - a wonderful Australian designer - I love the use of colour and whimsy about her designs - check out her latest! I used Thermore for the batting and cut it the same size as the top squares - I like to make these quilts that way! With a heavy heart, one cannot help but feel so much sympathy for our neighbours in Christchurch, New Zealand - so much loss, pain and suffering, God bless! 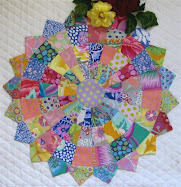 Lurline what a beautiful quilt i love your choice of colours,yes so sad about christchurch. Living on a fault brings us all close to the situation in New Zealand. Our prayers are with them. What a lovely quilt, it looks so cosy. I woke up this morning to hear about the earthquake on the radio, what a terrible thing to go through. 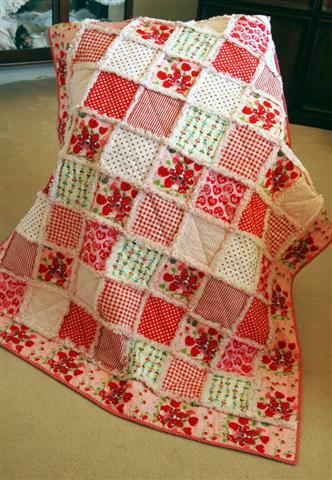 lurline,what a cozy quilt,love the colours! And our prayers are with New Zealand today. Your quilt turned out very beautiful. Since you cut the batting the same size as the squares, does that mean the batting is included in the ruffled/laundered edges? I love your quilt finish! So colorful and fun! I am so saddened and horrified by the quake in Christchurch. My thoughts and prayers are definitely with them. Your quilt has a warm look about it. 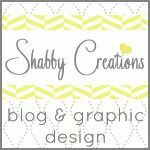 I always love to see your work. What a charming, cozy quilt. Also we share your thoughts about Christchurch. What a sad tragedy, our hearts go out to the people. It's a lovely cuddly quilt, the colours are so cheery. That would be devastating to see that church crumble. Your quilt has turned out beautifully. Christchurch is a devastating tragedy and we in NZ can't get our heads around it all - too hard to comprehend the extent of it. Ohhh, what a lovely quilt..!!.. Beautiful quilt, love the colours too. Lurline, I'm sure Heidi will love it. It is definitely a happy quilt. Christchurch and the surrounding area will be in our prayers. 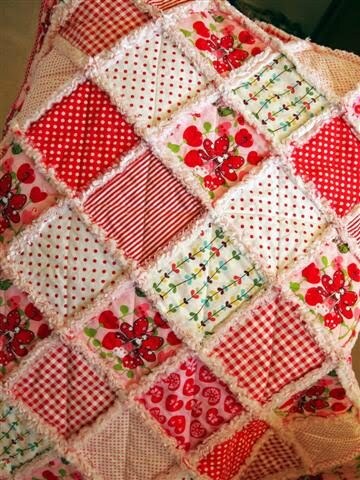 oh my I just love this quilt it is happy, love red! perfect for a little girl. 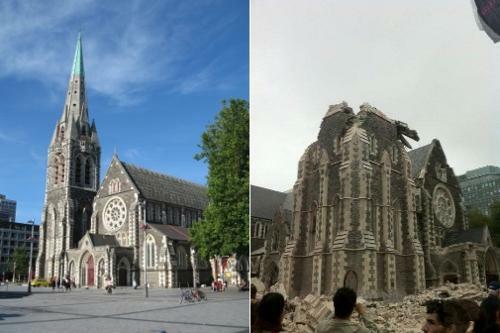 so sad what is happening in NZ I sure hope the aftershocks stop and they can start rebuilding, what a beautiful church so sorry to see all that damage. 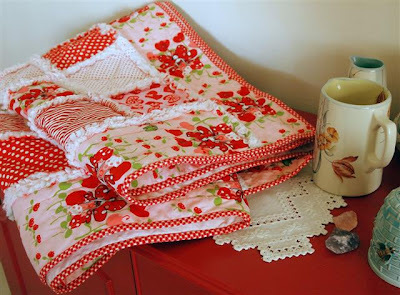 What a wonderful job you have done Lurline....it will be loved I am sure...the NZ news is devastating..
Lurline, the quilt is wonderful and cosy, I love the colours. The Cathedral is the centerpiece of the city, it's hard hearing about the tragedy and heartwarming at the same time with the rescues and the help from our cousins, the Aussies, it's the Anzac spirit. That quilt is just so charming. I love it. Love the reds you used! Beautiful fabrics for the quilt, Lurline. Our hearts are with the New Zealanders during this time of recovery. Beautiful quilt, and the colors ... I like so much !!!!! !